I can only think of Romanian heritage with a profound sense of pride. I travel the world but return to my home country whenever I can. There is so much beauty there and I feel compelled to reveal it to the world the best way I can, through imagery and words. 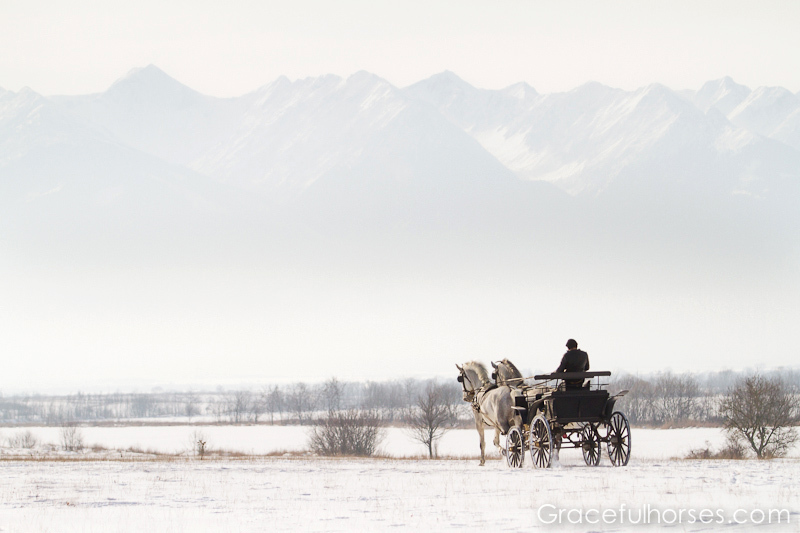 As I mentioned in one of my recent Romanian interviews, horses have greatly inspired my creative work which ultimately helped me bridge the two worlds meaningful to my life: Romania and North America. I can’t think of a better way to explore the mystery that goes centuries back, when my ancestors were the first to understand and treasure the importance of these majestic animals in their lives. The relationship continues on and there are people and places that need to be honored and mentioned, as what happens there helps preserve the spirit of this unique collaboration between the species. 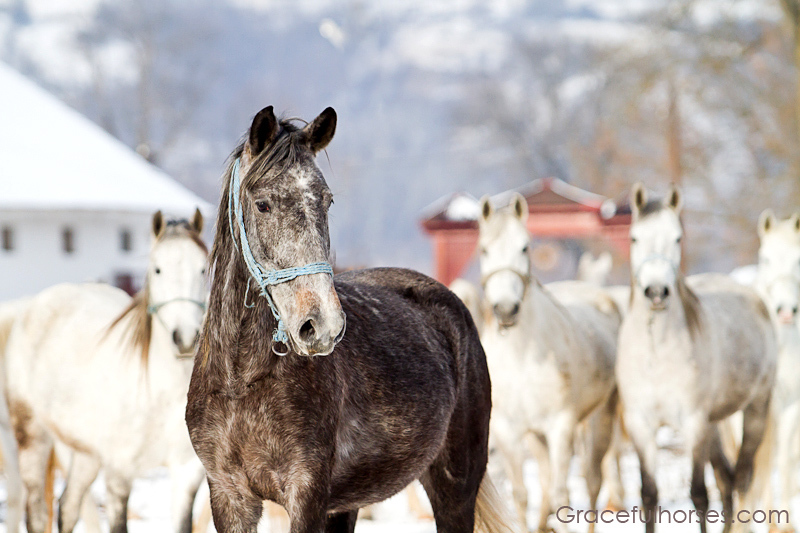 Last year I started a special journey with the intention of uncovering the variety and beauty of different horse breeds that exist today in Romania. 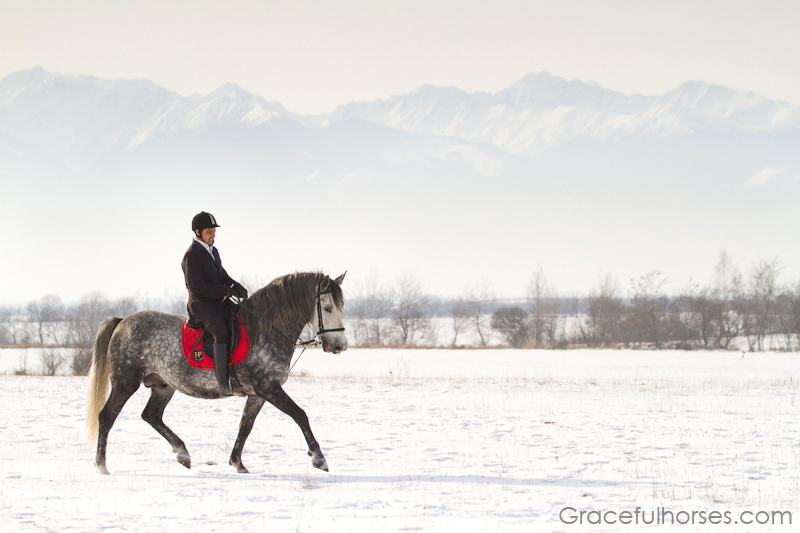 Last January I met the amazing Hutul horses and wrote their story. A year later I decided to travel West, to a region which has legitimately earned its fame all over the world: charming Transylvania. 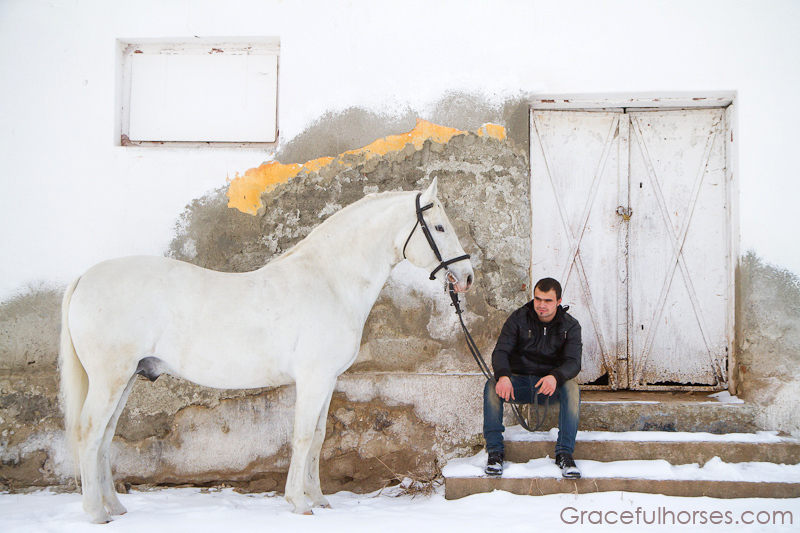 The prestigious Lipizzaner stud farm at ‘Sambata de Jos’ and its accomplishments in maintaining the purity of a gorgeous breed made me hop on a train at a time when part of the country was affected by massive snow storms. I arrived at my destination with no incidents and to my surprise, the mountains prevented most of the snow to get there and disrupt the normal order of things. I felt like I landed in a different realm, where a peaceful and calm atmosphere ruled. 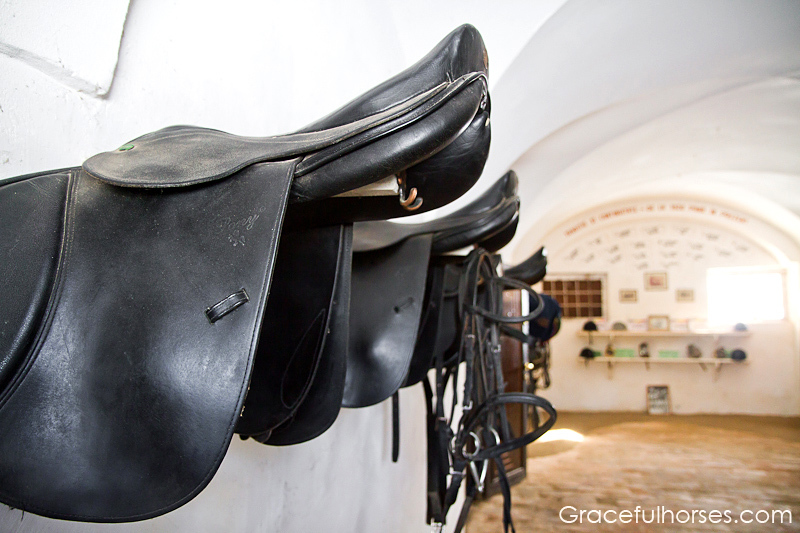 Located in the ‘Sambata de Jos’ picturesque village, the stud farm with the same name was created in 1874 and its first horses were brought there from the Mezohegyes state farm (Hungary), with all the blood lines originating from the Lipica (Lipizza) stud farm in Slovenia. Due to the imminence of the first world war, the entire ‘Sambata de Jos’ farm was moved to Hungary in 1913 and then was officially reopened by the Romanian State in 1920 (with 3 stallions and 22 brood mares). Conversano, Favory, Maestoso, Neapolitano, Pluto, Siglavy-Capriola, Tulipan and is in the process of acquiring the 8th: Incitato. The staff at ‘Sambata de Jos’ has their great way with the Lipizzans. 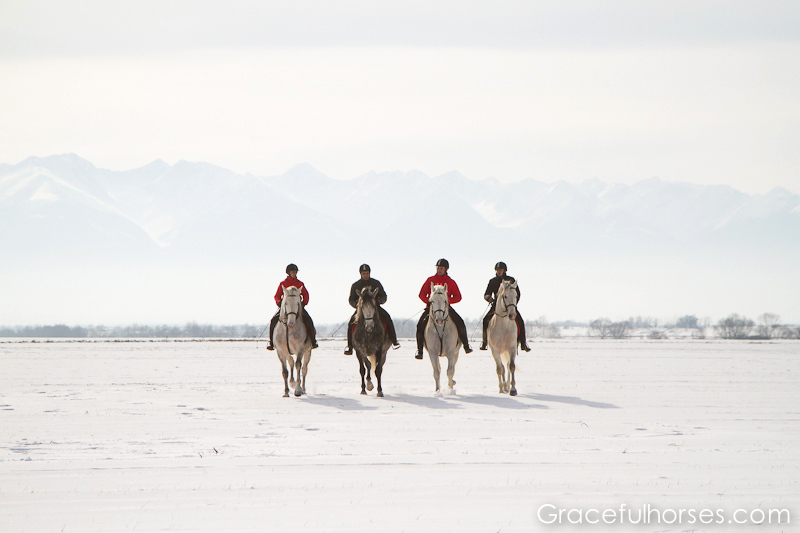 There is an undeniable bond both on the ground and astride. These dedicated, horse loving men not only take amazing care of their working partners, but they are the ones who perform in front of the lucky visitors who can watch some skillful dressage acts this breed is so very famous for. As per Wikipedia, the Lipizzan or Lipizzaner (Hungarian: Lipicai, Slovene: Lipicanec, Italian: Lipizzano, Croatian: Lipicanac, Czech: Lipicán), is a breed of horse closely associated with the Spanish Riding School of Vienna, Austria, where they demonstrate the haute école or “high school” movements of classical dressage, including the highly controlled, stylized jumps and other movements known as the “airs above the ground.” The Lipizzan breed dates back to the 16th century, when it was developed with the support of the Habsburg nobility. The breed takes its name from one of the earliest stud farms established, located near the Karst Plateau village of Lipica (spelled “Lipizza” in Italian), in modern-day Slovenia. 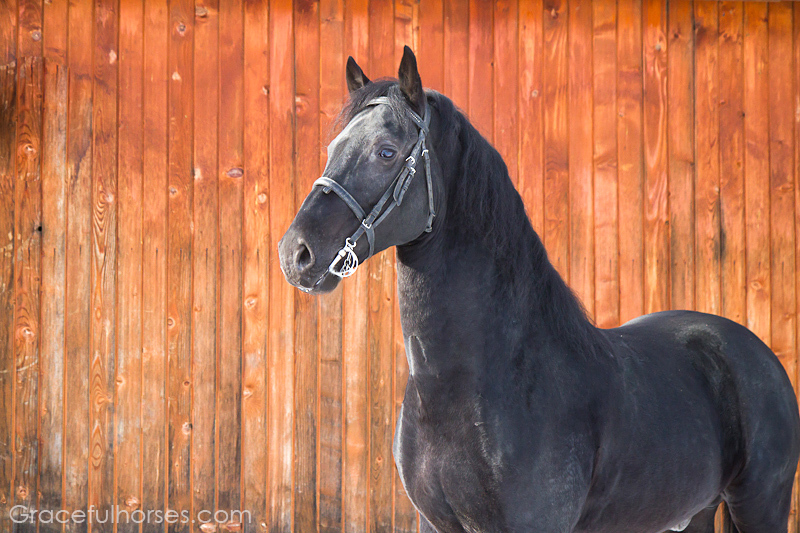 Back in 1580, a stock of Spanish horses (produced during Moorish rule by crossing Berber and Arab stallions with Iberian mares) was brought to Lipizza by the Archduke Karl Von Steiermark, with the intention of creating a non demanding, high resistance and elegant horse. Up until the 17th century, the breeding involved mainly Spanish and Italian blood lines (Generale, Amico, Superbo, Montedoro, Conversano, Neapolitano, Favory , Maestoso). During the 18th century an infusion of Arab blood was used, resulting in lines such as Bick, Siglavy, Araber, Saydan with an added degree of elegance and strengh. At the same time, on a smaller scale, the infusion of Danish blood created lines such as Pluto. 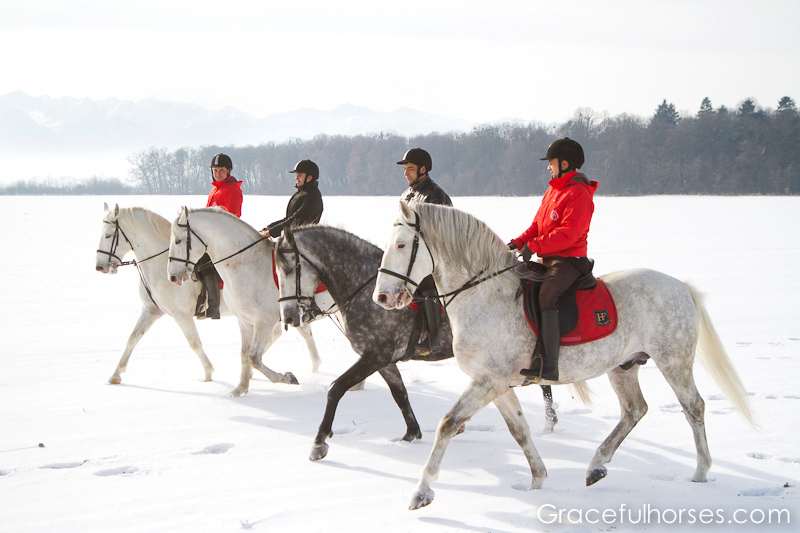 In 1728 Charles VI created the famous ‘Spanische Hofreiteschule’ dressage school in Vienna (Austria) which led to a flourishing period for the Lipizzan horses. 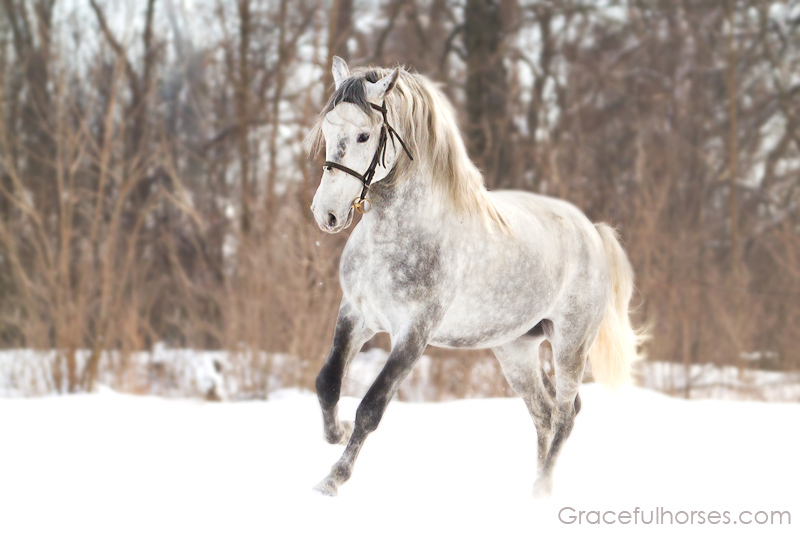 Today, the Lipizzan breed belongs to the European Cultural Heritage. 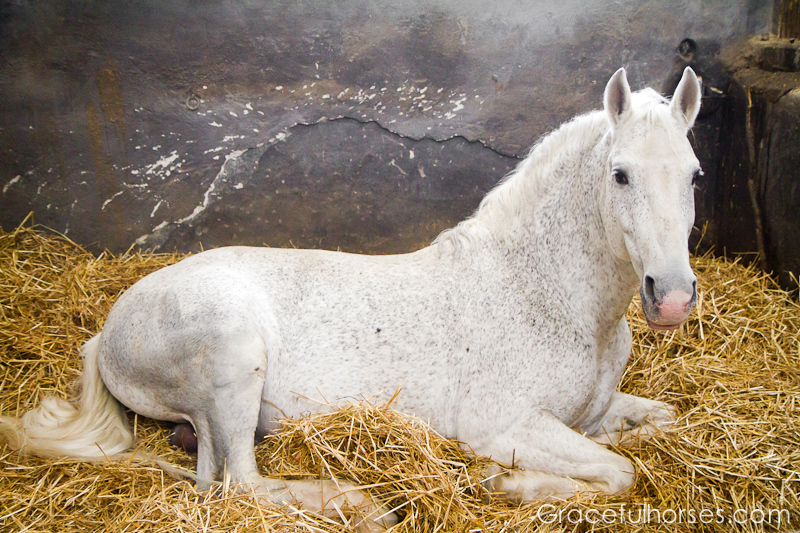 Lipizzan brood mares are gentle and gracious. I loved being in their company! 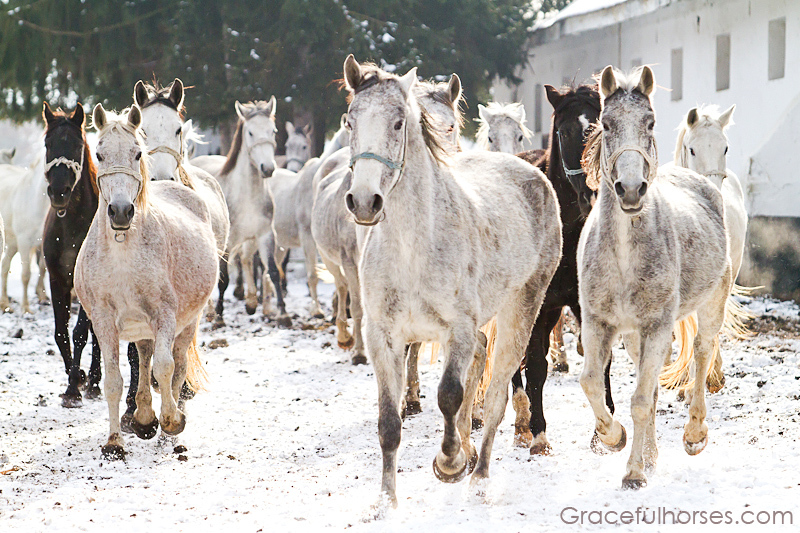 The Lipizzan brood mares at “Simbata de Jos’ go for an afternoon run. Most of them are gestating and love a light workout. 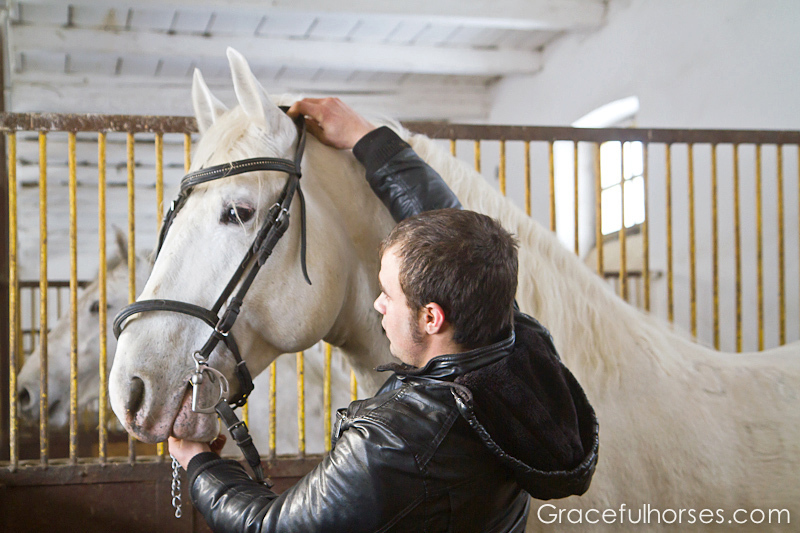 Since 2002 the Lipizzan stud farm at ‘Sambata de Jos’ has worked under the patronage of ‘Romsilva’ (Romanian National Forrest Registry). 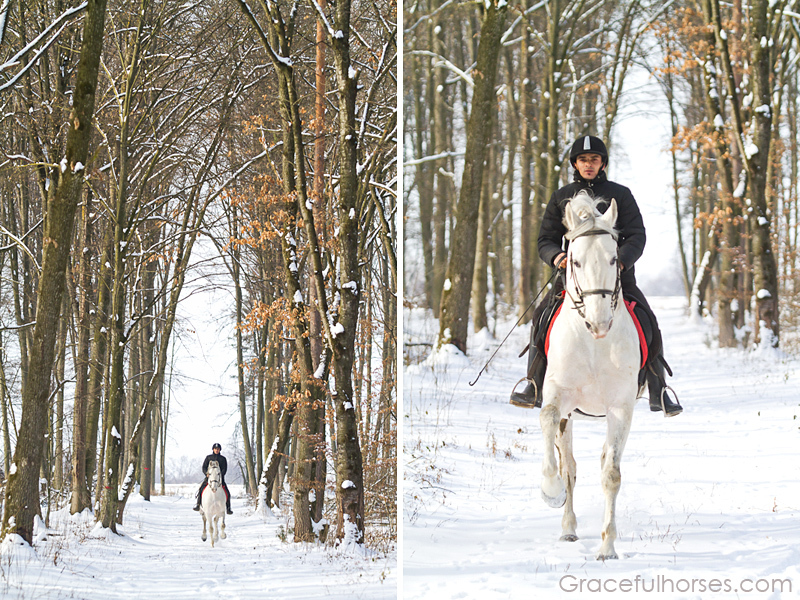 The stud farm can be visited daily, 45-60 min long dressage shows are available per request. Leisure horse and carriage trips are offered as well and they are a fantastic opportunity to explore the beautiful surroundings. My thanks go to Mr Cosmin Dragan, the head of the stud farm, for his warm cooperation and help with my vision. Thank you for letting me share your photos of the Lipizzans at the “Sambata de Jos” stud farm.